We know what to feed our body daily to get the essential vitamins and nutrients to be healthy and fit. However, do you know what your skin needs on a daily basis to be healthy and radiant? 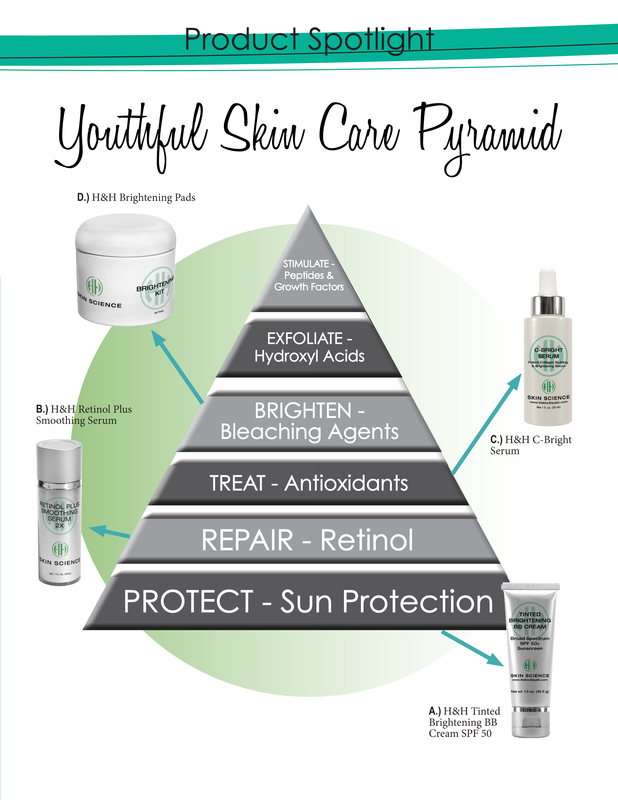 In order to easily communicate what your skin needs on a daily basis, I’ve created the H&H Skin Science Youthful Skin Care Pyramid. Treat – The third layer of the pyramid is focused on ensuring that the skin is getting the appropriate daily dose of antioxidants. The most essential antioxidant is vitamin C. The medical grade form of vitamin C in our H&H Skin Science products effectively stimulates collagen and elastin. This tightens and firms the skin and provides a healthy, radiant glow. (C.) H&H C-Bright Serum. Exfoliate and Stimulate – The last two layers of the pyramid focus on exfoliating the skin through the use of alpha and beta hydroxy acids, and stimulating the skin through the use of peptides and plant based stem cells and growth factors. Natural fruit acids, like alpha and beta hydroxy acids, gently exfoliate the skin, allowing medical grade skin care treatments containing vitamins A and C to be more readily absorbed. Peptides and cell repair enzymes stimulate the skin and provide for a more youthful appearance. The first four layers of the pyramid are considered the essentials of a great skin care regimen. Daily use of your SPF 50+, retinol, vitamin C treatment and brightening agent will ensure that your skin is healthy and radiant. Think of it like brushing your teeth. We brush our teeth usually at least two times a day to maintain good oral hygiene. So, why would we not treat our skin twice daily to ensure it receives the nutrients needed to be healthy and radiant?